Canola is quite resilient to light hail at up to 20% flower. The crop can flower longer to compensate, and may recover with only minimal to moderate yield loss. 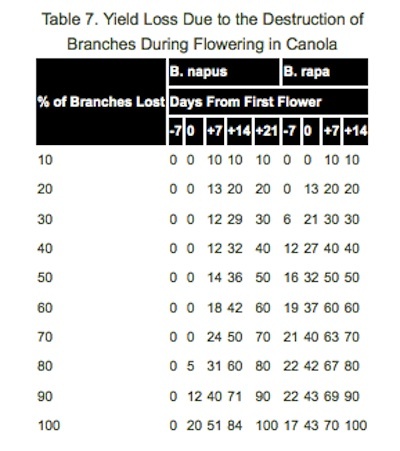 Canola has also shown remarkable recovery from more intense hail at 20% flower. However, a crop flattened by hail is unlikely to recover. If regrowth occurs, which is possible, plants are set back so far that maturity becomes a major factor. Pre-harvest is a good time to scout for disease severity. 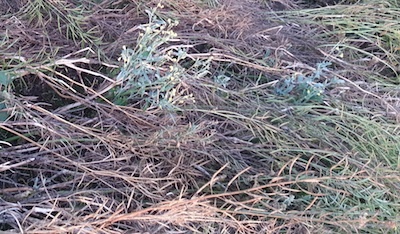 Fields with lots of diseased plants may also be poorer candidates for straight cutting due to the increased shattering risk. 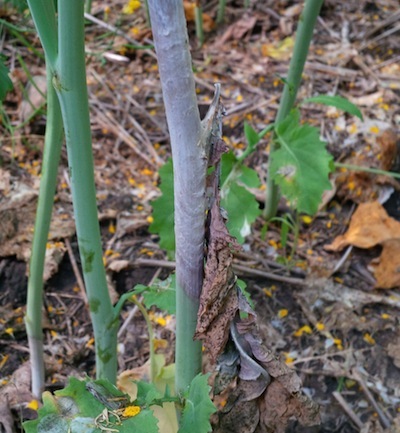 Read more for tips on how to identify blackleg, sclerotinia and alternaria. Alternaria has infected the pods of many hailed crops. Keep watching these crops. When infected areas make up 50% or more of the crop, swathing early may be the best way to salvage the yield in those infected plants if a large proportion of pod surfaces are covered with the black spots. Read more to see photos of alternaria infection.